To maintain their beauty and desirability, however, hardwood floors need to be cleaned and maintained properly. Here are four steps to keep your hardwood floors looking great throughout the lifetime of your home. The finish on your hardwood floors can scratch. So, it is best to remove dust, dirt and debris that can cause scratches, even micro-fine scratches that are hardly visible to the naked eye, on a daily basis. It is recommended that this daily dusting be done with a microfiber material which uses a static charge to attract dust and allergens and reach into floor pores to lift dirt more effectively.5 The National Wood Flooring Association (NWFA) also recommends vacuum your hardwood floors on a weekly basis.6 Do not use your vacuum’s beater bar attachment, as it can scratch the floor’s finish. Use the floor-brush attachment instead. 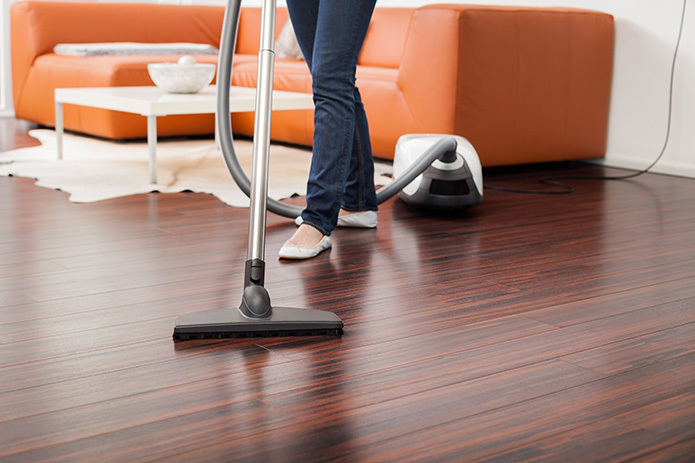 If you have a bare wood floor setting on your vacuum, you should dial to that setting. Following these four simple steps will go a long way toward keeping your hardwood floors looking great for a lifetime. The NWFA also recommends a new coat of finish every three to five years, and a complete sand and refinish every few decades. Have questions about your hardwood floors or are thinking about installing them? Cameron the Sandman Hardwood Flooring Services can help! We offer new hardwood floor sales, refinishing, replacement and more. We work with EVERY species of wood – hardwood flooring, exotic hardwood flooring, oak, cherry, maple, mahogany, walnut, and bamboo – and in a host of styles and stains. There is a lot to know about a wood floor, you can count on our design professionals to educate you and help you select and maintain the perfect wood floor for your Metro Detroit home or business. Contact us at 248-477-8108 today to learn more!